The Cucumber is so misunderstood. Is it a veggie for salads? Eye pads for your facial? Is it a garnish for an hors d’oeuvres tray? Or is it that odd vegetable that takes over your garden? It is safe to say that the cucumber fits all of the above categories. We love cucumbers and they “love” us back. 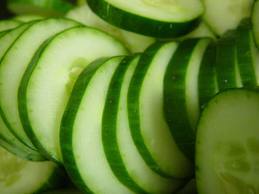 The healthy skincare benefits of the cucumber are numerous.Thus, we ♥ our cucumbers and our skincare! The cucumber is thought of as a vegetable, but it is actually a fruit because it has seeds. It is part of the gourd family and can be eaten raw or cooked. It has a variety of health benefits for your regular food diet and it is commonly used as a required item for a skin improvement diet. It is known as a cooling agent as it is made up of 90% water. It is also known to help reduce swelling around the eyes or help with the big dark circles under your eyes. Many professional model shoots would not happen without having an adequate amount of cucumbers for the models to munch on and to use on their eyes between shoots! Keeping your body well hydrated is a requirement for healthy skin. Always have cucumbers handy, especially during the height of the summer when they are plentiful. The first thing someone might tell you about the cucumber is that it has amazing, soothing properties. If you have over-done something like a strong mask or used too much glycolic cleanser for instance, the first thing you might use to soothe the irritation is a product with cucumber and aloe. They are two ingredients that usually are paired up nicely to help soothe redness or take the sting out of an aggressive mask you might have left on too long. When eating the cucumber you are increasing your intake of water (always good for the skin) and the water intake combined with the potassium and vitamin E in the vegetable helps to flush out toxins. A cucumber has such a light fragrance that when adding this natural ingredient to cleansers it helps by providing a “clean, light, pleasing scent” and assists with the actual cleansing of the skin. It is a common ingredient in cleansers. People with sensitive skin types are drawn to a mask containing cucumber due to its soothing and cooling properties. Some people might turn red fast when using a new product. Using a calming mask containing cucumber will allow you to still be able to use that slightly irritating product and then calm the skin back down using the mask with cucumber. Your neighborhood esthetician at the spa always has a facial mask containing cucumber handy in case of something like this happens. You can’t leave the spa with a red face! Calming properties are the essence of the cucumber. Many new natural products are using the cucumber juice as a main ingredient due to its amazing skin care benefits. Keep in mind that all products do contain water, so in some cases manufacturers are using the “juice” ingredient to hide the amount of actual water in a product. Don’t be fooled into thinking your product is aqua free. Juice contains water. While we love, love, love the amazing cucumber it has very limited effects in helping to reduce fine lines and wrinkles. It only does so much. Think of it has a great calming ingredient for when you might have stayed out in the sun too long or overused an aggressive mask. Always have a calming product handy for these moments of skin emergencies. You might have an exciting date and you don’t want to have a red face that you tried to cover up with too much make-up. Calm your skin. We recommend our Renaud Naturals Rosacea Anti- Redness Moisturizer for such emergencies. We also add another great natural ingredient – the Petasites Japonicas Root Extract to assist with redness as well. This is one of our popular calming and hydrating moisturizers. It’s Great, but it Doesn’t take care of Everything! For fine lines and wrinkle reducing products look towards a products that contain peptides and/or apple stem cell technology. These two recent advances in skincare science will do the most good for your skin regrading anti-aging. Peptides help to wake up your muscles and encourage the ligaments to work better so that frown lines disappear faster. The cucumber cannot touch the power of active ingredients like peptides and the new apple stem cell technology like we have in our Renaud Naturals Cell Therapy Moisturizer. Overall, you can eat the delightful cucumber for wonderful, soothing skincare benefits and you can apply the properties of the cucumber through your natural skincare for amazing results as well. This is why we wrote our “Love Story” today. Even as technology advances, the ingredients found in nature should be of the highest priority for you in selecting effective, natural skincare. For all of our wonderful natural skincare products please see our Renaud Naturals website.